'I Don't Believe That Torture Works,' Gina Haspel Says At Senate Hearing : The Two-Way "I absolutely was an advocate" for destroying CIA interrogation tapes in 2005, Haspel said, if the act was found to be "conforming to U.S. law." CIA director nominee Gina Haspel testifies at a Senate intelligence committee hearing Wednesday. "I would not allow CIA to undertake activity that I thought was immoral — even if it was technically legal," said Gina Haspel, the career CIA officer who is now nominated to lead the agency. It was one of many replies she gave on Wednesday to pointed questions about what her values and priorities would be as leader of America's intelligence agency. Haspel was questioned by both her critics and her backers, testifying under oath at a Senate intelligence committee hearing on her nomination. Several senators pressed Haspel for details about her role in destroying tapes of CIA interrogations of a detainee — and whether she had been in favor of that step. "I absolutely was an advocate" for destroying the tapes because of security concerns, Haspel said, if the act was found to be "conforming to U.S. law." The nominee also said she had not played a role in creating the CIA's detention and interrogation program and didn't know of its existence until about a year after it had been started. Sen. John McCain, R-Ariz., released a statement urging the Senate to reject Haspel's nomination. He said, "Ms. Haspel's role in overseeing the use of torture by Americans is disturbing. Her refusal to acknowledge torture's immorality is disqualifying." 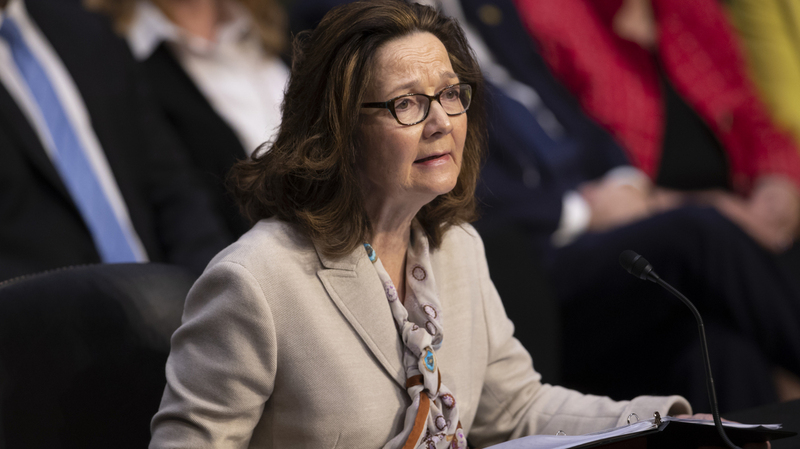 When asked about President Trump's previously stated idea that torture "absolutely works," Haspel said, "I don't believe that torture works." She added that valuable information had been gained from debriefing senior al-Qaida operatives — and that it was impossible to determine whether "interrogation techniques played a role in that." That response came during questioning by Sen. Kamala Harris, D-Calif. — who also pressed Haspel to say whether she now views the CIA's interrogation program as immoral. Haspel, the first woman nominated as the director of the CIA, hopes to succeed Mike Pompeo, who left to lead the State Department. But she is also facing scrutiny over her role in the interrogation program — and whether she would follow orders that might compel the CIA to cross the line into torture and other methods. Several senators also voiced their concerns that as the CIA's current acting director, Haspel has potentially been involved in making decisions about which portions of her record to reveal to the public. You can watch the hearing on the committee's page here. The hearing started nearly 10 minutes late, partly because of the intense media spotlight. Cameras fluttered around Haspel for several moments as she sat. "You are without a doubt the most qualified person" that Trump could nominate for the CIA job, said committee Chairman Sen. Richard Burr, R-N.C., in his opening remarks. Sen. Mark Warner, D-Va., the panel's vice chairman, agreed that Haspel is "among the most experienced people to be nominated" to lead the CIA — but, he added, "many people — and I include myself in that number — have questions about the message the Senate would be sending by confirming someone for this position who served as a supervisor in the counterterrorism center during the time of the [CIA's] rendition, detention, and interrogation program." Burr used his first question to "dig right into it," as he said, asking Haspel about the CIA's destruction of tape recordings that showed the agency's personnel interrogating detainees, in sessions that included waterboarding and other methods that would be considered to be torture. Haspel said that there were "security issues" about the tapes because CIA personnel were visible in the footage. She added that she did not appear in the tapes, despite some reports to the contrary. And she said the agency didn't believe it was legally obligated to preserve the video records. "The consistent legal advice — it never changed — was that there was no legal requirement to retain the tapes," Haspel said. She added that the agency considered its written description of the videos to be the official record of their content and that those writings had been reviewed and determined to be accurate and complete. Taking up where Burr left off, Warner then asked Haspel about the tapes and whether the threat of multiple investigations played a role in their destruction. Haspel replied that the agency was focused on potential security risks. Warner moved on to ask Haspel if she believes the CIA's interrogation program in the early 2000s "was consistent with American values." Haspel began her reply by discussing how America has changed since the Sept. 11., 2001, terrorist attacks and the country's decision to hold itself to a "stricter moral standard," adding that she supports that standard. Warner followed that up by asking how Haspel would respond to a request from Trump and the White House that might run counter to her moral values. "I would never, ever take CIA back to an interrogation program," Haspel said. She added that she would not "put CIA officers at risk by asking them to undertake risky, controversial activity again." Warner asked, "If this president asked you to do something that you find morally objectionable, even if there is an [Office of Legal Counsel] opinion, what will you do? Will you carry out that order or not?" "Senator, my moral compass is strong," Haspel said. "I would not allow CIA to undertake activity that I thought was immoral — even if it was technically legal. I would absolutely not permit it." Prodded again by Warner, Haspel said, "No. I believe that CIA must undertake activities that are consistent with American values." After Haspel said that she wouldn't have the agency do anything she viewed as immoral, she was pressed by Harris to say whether she viewed the CIA's interrogation program as immoral. Harris wanted a yes-or-no answer — a common, if often unfulfilled request, in congressional hearings. Haspel refused to give one, saying the CIA staff had worked "given the legal tools that we were authorized to use." In what became a back-and-forth exchange, Harris asked, "Do you believe in hindsight that those techniques were immoral?" "Senator, what I believe sitting here today is, I support the higher moral standard we have decided to hold ourselves to," Haspel said. In another portion of the hearing, Haspel told Sen. Susan Collins, R-Maine, that when she learned about the CIA's interrogation program, she was told that it had been designed by interrogation experts, "that the highest legal authority in the United States had approved it, and that the president of the United States had approved it" as well as the CIA's leaders. When asked by Collins whether her views about the program had "evolved" over time, Haspel said, "Senator, they have." Reiterating her approval for the U.S. adopting a higher standard for interrogations, Haspel added, "The very important thing to know about CIA is, we follow the law. We followed the law then, and we follow the law now." Collins then noted that as a candidate, Trump had said he was in favor of waterboarding — and even more extreme measures. "If the CIA has a high-value terrorism suspect in its custody," Collins said, "and the president gave you a direct order to waterboard that suspect, what would you do?" "I do not believe the president would ask me to do that," Haspel replied. "But," she added, before pausing for a brief moment, "We have, today in the U.S. government, other U.S. government entities that conduct interrogations. DOD uses the Army Field Manual, and they conduct battlefield interrogations" — and the CIA has expertise that can support those interrogations. The FBI can also help, she said. "CIA is not the right place to conduct interrogations," Haspel said, adding, "We don't have interrogators, and we don't have interrogation expertise." Saying that her nomination reflects a respect for her opinion, Haspel said, "My experiences during those days after 9/11 inform my views. I'm extremely knowledgeable, and I'm also extremely knowledgeable about the price CIA working-level men and women out in the trenches paid for decisions made after 9/11." As Sen. Dianne Feinstein, D-Calif., began her questioning of Haspel, she noted, "I think as you know, I like you personally very much," adding, "this is probably the most difficult hearing" she's ever sat on. She then asked Haspel to explain whether she is the CIA official that the agency's former general counsel John Rizzo identified in his memoir as a "staunch advocate" of destroying interrogation videos who had also run the agency's interrogation program. "Senator, I'm so pleased you asked me that question," Haspel said before replying, "No." She said that Rizzo had issued a correction to clarify that Haspel had not run the interrogation program — and Feinstein then asked whether Haspel had advocated the tapes' destruction. "I absolutely was an advocate" for destroying the tapes, Haspel said, "if we could [do that] within and conforming to U.S. law, and if we could get policy concurrence to eliminate the security risk posed to our officers by those tapes." She added that the tapes documented 92 interrogations of one detainee. The recordings were destroyed in 2005, on the order of the former head of the CIA's clandestine service, Jose Rodriguez, for whom Haspel served as chief of staff. Haspel acknowledged drafting the cable from Rodriguez ordering the tapes' destruction. She also said, as Rodriguez has, that he acted on his own authority, without consulting his superiors. She also stated that she knew "there were some objections" in Washington to destroying the tapes. "Was it a matter of coincidence that this decision was made to destroy the tapes in the same week that two major stories appeared in American newspapers, the Levin amendment was being considered, and the McCain amendment was on the floor of the U.S. Senate — was it a mere coincidence that ... after three years of delay, the decision was taken to destroy the tapes?" "Senator, I don't believe, in the directorate of operations front office, we were aware of legislation," Haspel said. "The lawyers may have been aware. I do not believe we were aware." She added, "I do not recall being aware" of the intense public interest that had emerged that week. A protester interrupted the questioning by Sen. Roy Blunt, R-Mo., a woman in the crowd watching the hearing who shouted, "The question is, what do you do to human beings in U.S. custody?" As Capitol Police officers escorted the woman from the chamber, she shouted, "Bloody Gina! You are a torturer!" After that incident, Blunt returned to asking Haspel about the dynamics of how she works with the Trump administration. In his opening remarks at the start of the hearing, Warner did not say that he will vote "no" on Haspel's nomination. But while noting that Haspel has said U.S. law about interrogation has changed, he said, "I appreciate that, but it is not enough." At the hearing, Haspel was formally introduced — and praised — by two former senators who once sat on the intelligence panel, Saxby Chambliss, R-Ga., and Evan Bayh, D-Ind. Large parts of the nominee's record remain classified. In the standard questionnaire for presidential nominees, one section was redacted completely: a request for Haspel to list specific sources and amounts of all income for the past five years. The toughest questions for Haspel — at the open hearing or in meetings behind closed doors — revolve around torture. Haspel says she would not bring that type of program back. In her prepared remarks for Wednesday's hearing, the career CIA officer, who has rarely spoken in public, said that she understands the interest in that part of her career. "I have views on this issue, and I want to be clear," she said. "Having served in that tumultuous time, I can offer you my personal commitment, clearly and without reservation, that under my leadership CIA will not restart such a detention and interrogation program." One of her biggest critics on the committee is Sen. Ron Wyden, D-Ore., who said the CIA has glossed over Haspel's career in an attempt to get her confirmed. "There has been a wall-to-wall cover-up by the agency, with respect to her background," Wyden said on Morning Edition Wednesday. The White House says Haspel is the best candidate for the job. It also points to her record, citing her receipt of the Intelligence Medal of Merit, a Presidential Rank Award, and the Donovan Award, as well as the George H.W. Bush Award for Counterterrorism, "for spearheading an operation that led to valuable intelligence collection and the arrest and imprisonment of two terrorists." Marc Short, the president's legislative affairs director, told NPR on Tuesday, "If she's not qualified and the best person to lead, then that's a sad state of affairs to where the U.S. Congress is right now in their adjudication about who's a proper fit to run the CIA." Of Haspel's involvement with waterboarding, Short said, "She was conducting the work that she did in compliance with the law of the United States, approved by the United States attorney general. She followed the orders she was given." As for what her priorities would be as the head of the CIA, Haspel said in her prepared remarks, "Our strategy starts with strengthening our core business: collecting intelligence to help policymakers protect our country and advance American interests around the globe." "And, finally, it involves investing in our partnerships — both within the U.S. government and around the globe," she said.